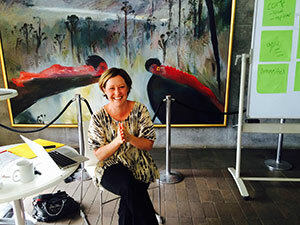 As part of the 2015 NSW Regional Science Hubs Leadership Forum held at Bundanon Trust in November, marketing consultant Kate Dezarnaulds ran a half-day workshop on fundraising and partnerships. Working in groups, Science Hub members considered the best available avenues for securing financial and other forms of support for their local outreach and engagement initiatives. At the heart of all of these conversations was the question of why science outreach work matters. How can the organisations involved in NSW Regional Science Hubs clearly articulate the pressing needs they are trying to address? Why is it important for Australia that conversations take place within the broader community on many levels about the central place of science, technology, engineering and maths in our lives? In terms of the value that Science Hubs bring to their communities, how can members demonstrate the impact of their collective outreach efforts? Why do we believe that it is important to keep doing what we do? Articulating a unifying vision for the NSW network of Regional Science Hubs is difficult, particularly given the broad range of organisations involved in this initiative at a local level and the different areas they choose to explore. Each Science Hub has a unique story to tell about its contributions to the community and the benefits its programs may provide to audiences, sponsors, partners and hosting organisations. Even more difficult is the task of finding support for program administration and coordination. With no designated funds available to support the ongoing management of a Science Hub, finding a base level of operational funding can be a struggle, particularly as not all member organiations are equally engaged and actively contributing to program delivery. Kate led us through various fundraising approaches Science Hubs could consider including paid memberships, a minimum level of in-kind support from all partners and non-financial contributions. Questions arose around where the responsibility lies to do this ground work and which organisation would be willing to pay staff for the time it takes them to do it. Science Hubs run by volunteers without access to regular income are particularly vulnerable without funding support. Among topics canvassed were; how to prepare a targeted pitch that presents a noble ‘neediness’ in a compelling rather than negative way; finding and connecting with the right people and organisations that might be able to help and the importance of engaging with influential advocates. Funding and support sources considered included philanthropy, crowd funding, business, industry, universities, local and state government and national initiatives. Acknowledgement – how will their contributions be recognised? Exclusivity – free entry, VIP access, what perks can they offer to their people? Access – how can they contribute to program and strategy design, access knowledge and experiences, meet key people and engage in networking? Integration – what unique experiences are available for partners’ staff to try or for them to integrate into their own programs? Promotion – how will programs be promoted to broader community? Content – what content can they use for their own channels? With these ideas in mind, Science Hub members have agreed to work with their members and Inspiring Australia (NSW) to consider issues raised in this useful and informative workshop. Many thanks to Kate Dezarnaulds, whose recent philanthropic accomplishments as Head of Partnerships for TedX Sydney and a consultant to The Chaser make her insights so valuable.